I think there's huge problems with this and wouldn't pay much attention to it. Maybe Saudi tea drinking is associated with work, and coffee with leisure for example? Maybe thia association means increasing tea drinking is associated with a greater/earlier need to work; relative poverty and a diet rich in high-D fish. As pgeek pointed out, this study really doesn't control for variables well. the average 25D levels are similar to other previously reported measures. what we can say about drinking coffee or tea and a person's 25D level is ... nothing. thanks for the confirmation, and the good summary. A clinical trial.Corrêa TA, Rogero MM, Mioto BM, Tarasoutchi D, Tuda VL, César LA, Torres EA.SourceDepartment of Nutrition, School of Public Health, University of São Paulo, São Paulo, Brazil. Abstract OBJECTIVE: The aim of this study was to compare the effects of medium light roast (MLR) and medium roast (MR) paper-filtered coffee on cardiovascular risk factors in healthy volunteers. METHODS: This randomized crossover trial compared the effects of consuming three or four cups (150 mL) of MLR or MR coffee per day for 4 wk in 20 healthy volunteers. Plasma lipids, lipoprotein(a) (Lp[a]), total homocysteine, and endothelial dysfunction-related inflammation biomarkers, serum glycemic biomarkers, and blood pressure were measured at baseline and after each intervention. RESULTS: Both roasts increased plasma total cholesterol, low-density lipoprotein-cholesterol, and soluble vascular cell adhesion molecule-1 (sVCAM-1) concentrations (10%, 12%, and 18% for MLR; 12%, 14%, and 14% for MR, respectively) (P < 0.05). MR also increased high-density lipoportein-cholesterol concentration by 7% (P = 0.003). Plasma fibrinogen concentration increased 8% after MR intake (P = 0.01), and soluble E-selectin increased 12% after MLR intake (P = 0.02). No changes were observed for Lp(a), total homocysteine, glycemic biomarkers, and blood pressure. CONCLUSION: Moderate paper-filtered coffee consumption may have an undesirable effect on plasma cholesterol and inflammation biomarkers in healthy individuals regardless of its antioxidant content. Regarding previous post of mine, we were thinking that cafestol - a diterpene , found in lipid fraction of coffee, was responsible for cholesterol raising effect. Now it seems it is not and CGA could be a suspect. Inflammation and immunosuppression are two different things. J Agric Food Chem. 2013 May 8;61(18):4371-8. doi: 10.1021/jf400920x. Epub 2013 Apr 26.Supplementation of a high-fat diet with chlorogenic Acid is associated with insulin resistance and hepatic lipid accumulation in mice.Mubarak A, Hodgson JM, Considine MJ, Croft KD, Matthews VB.SourceSchool of Plant Biology, and the Institute of Agriculture, University of Western Australia , Crawley, Western Australia 6009, Australia. AbstractThe increasing prevalence of the metabolic syndrome requires a greater need for therapeutic and prevention strategies. Higher coffee consumption is consistently associated with a lower risk of type 2 diabetes in population studies. Dietary polyphenols have been linked to benefits on several features of the metabolic syndrome. Chlorogenic acid (CGA), a major component of coffee, is one of the most consumed polyphenols in the diet. In our study, we conducted a controlled dietary intervention over 12 weeks in male mice. There were three dietary groups: (i) normal diet, (ii) high-fat diet, and (iii) high-fat diet + CGA. We assessed the effect of CGA at a physiologically obtainable dose (1 g/kg of diet) on high-fat-diet-induced obesity, glucose intolerance, insulin resistance, and also fatty acid oxidation and insulin signaling in C57BL/6 male mice. Supplementation of CGA in the high-fat diet did not reduce body weight compared to mice fed the high-fat diet alone (p = 0.32). CGA resulted in increased insulin resistance compared to mice fed a high-fat diet only (p < 0.05). CGA resulted in decreased phosphorylation of AMP-activated protein kinase (AMPK) (p < 0.001) and acetyl carboxylase β (ACCβ), a downstream target of AMPK (p < 0.05), in liver. The liver of mice fed a high-fat diet supplemented with CGA had a higher lipid content (p < 0.05) and more steatosis relative to mice fed a high-fat diet only, indicating impaired fatty acid oxidation. This study suggests that CGA supplementation in a high-fat diet does not protect against features of the metabolic syndrome in diet-induced obese mice. It is interesting how scientists choose their words. Does not protect, but what if it contributes ? Very enjoyable paper about Adenosine being a big friend of tissue oxygenation.
"" adenosine in turn functions to restore balance between oxygen demand and oxygen supply. Adenosine increases oxygen supply acutely by causing vasodilation and increased blood flow in the heart, skeletal muscle, brain, and other tissues [218–220]. Adenosine can decrease oxygen demand in the heart by multiple mechanisms [221–224]. For these reasons, adenosine is thought to serve as a negative feedback signal to maintain tissue oxygenation within a normal range. Adenosine is also thought to have a long-term role in maintaining tissue oxygenation by stimulating angiogenesis . "" Adenosine triphosphate (ATP) is considered by biologists to be the energy currency of life. It is the high-energy molecule that stores the energy we need to do just about everything we do. It is present in the cytoplasm and nucleoplasm of every cell, and essentially all the physiological mechanisms that require energy for operation obtain it directly from the stored ATP. (Guyton) As food in the cells is gradually oxidized, the released energy is used to re-form the ATP so that the cell always maintains a supply of this essential molecule. Karp quotes an estimate that more than 2 x 10e26 molecules or >160kg of ATP is formed in the human body daily! ATP is remarkable for its ability to enter into many coupled reactions, both those to food to extract energy and with the reactions in other physiological processes to provide energy to them. In animal systems, the ATP is synthesized in the tiny energy factories called mitochondria. From the same paper, the whole paragraph is very interesting. Vascular growth is very important for tissue regeneration, and for actions of localized immune system probably, judging from this statement. Adenosine can activate HIF1 by way of A2A receptors in macrophages  and liver cells , which in turn can increase VEGF-A production. adenosine activation of the A1 receptor on macrophages can also stimulate VEGF-A production [243,244]. Caffeine blocks both A1 and A2A receptors. 3.6 ROLE OF ADENOSINE IN METABOLIC REGULATION OF VASCULAR GROWTH Adenosine is a nucleoside produced in all cells of the body by stepwise dephosphorylation of ATP. Hypoxic tissues produce adenosine from ATP, and the adenosine in turn functions to restore balance between oxygen demand and oxygen supply. Adenosine increases oxygen supply acutely by causing vasodilation and increased blood flow in the heart, skeletal muscle, brain, and other tissues [218–220]. Adenosine can decrease oxygen demand in the heart by multiple mechanisms [221–224]. For these reasons, adenosine is thought to serve as a negative feedback signal to maintain tissue oxygenation within a normal range. Adenosine is also thought to have a long-term role in maintaining tissue oxygenation by stimulating angiogenesis . Physiological concentrations of adenosine produced under hypoxic conditions stimulate a concentration-dependent proliferation and migration of endothelial cells obtained from both large and small blood vessels [225–232]. Endothelial cell proliferation and migration are key steps in the angiogenesis process necessary for establishing capillary sprouts in the microenvironment of a hypoxic tissue where adenosine levels are highest. Numerous studies have shown that adenosine or adenosine uptake inhibitors (which increase extracellular levels of adenosine) can stimulate blood vessel growth in various animal models [233,234]. The angiogenic actions of adenosine are thought to be mediated, as least partially, by its ability to increase the expression of VEGF-A: administration of adenosine [227,235–242] as well as the up-regulation of endogenous adenosine  can induce expression of VEGF-A in many cell types. Figure 3.7 shows a mechanism for adenosine-induced angiogenesis under hypoxic conditions. AMP is dephosphorylated by ecto-5-nucleotidase, producing adenosine in the extracellular space adjacent to a parenchymal cell, which is the major source of adenosine under hypoxic/ischemic conditions. The parenchymal cell could be a cardiomyocyte, skeletal muscle fiber, hepatocyte, or any other functional element of an organ or tissue that is subjected to a hypoxic environment. Extracellular adenosine then stimulates the release of VEGF-A from the parenchymal cell by activating A2A or A2B receptors; adenosine activation of the A1 receptor on macrophages can also stimulate VEGF-A production [243,244]. VEGF-A released from parenchymal cells and monocytes binds to its receptor (VEGFR2) on endothelial cells, stimulating proliferation and migration. VEGF-A is also a survival factor or maintenance factor for endothelial cells that may be regulated by adenosine under basal conditions . 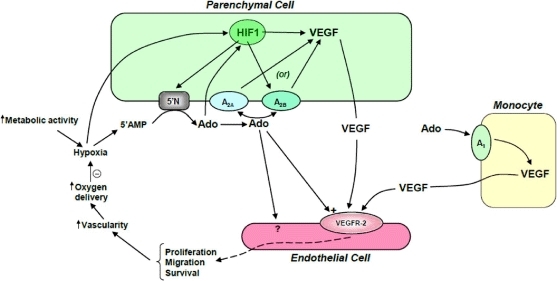 Adenosine can stimulate endothelial cell proliferation independently of VEGF-A, which probably involves modulation of other proangiogenic and antiangiogenic growth factors or perhaps an intracellular mechanism . In addition, hemodynamic factors associated with adenosine-induced vasodilation may have a role in development and remodeling of the capillaries as well as larger blood vessels. Once a new capillary network has been established and the diffusion/perfusion capabilities of the vasculature can supply the parenchymal cells with adequate amounts of oxygen, adenosine, and VEGF-A as well as other proangiogenic and antiangiogenic growth factors return to near-normal levels, thus closing the negative feedback loop . Multiple interactions can facilitate the adenosine induction of VEGF-A. Some of these interactions include the following: Adenosine can activate HIF1 by way of A2A receptors in macrophages  and liver cells , which in turn can increase VEGF-A production. HIF1 can increase production of the adenosine A2B receptor under hypoxic conditions . The activity of ecto-5-nucleotidase (CD73) can be increased in the ischemic heart  and brain  of intact animals, possibly by way of a HIF1-dependent regulatory pathway . Also, adenosine can increase the production of VEGFR2 in bovine retinal endothelial cells . In addition, adenosine can modulate the expression of other angiogenic growth factors. An adenosine analog (NECA) increased the expression of the proangiogenic factors insulin-like growth factor-I (IGF-I) and basic fibroblast growth factor (FGF2) in human retinal endothelial cells . NECA also increased the expression of the proangiogenic factors interleukin-8 (IL-8) and angiopoietin-2 (Ang2) mRNA in human mast cells  as well as FGF2 in human microvascular endothelial cells . Other studies have shown that adenosine and A2A agonists can down-regulate the antiangiogenic factor tumor necrosis factor (TNF)-α in mouse macrophages . TNF-α inhibits the proliferative response of endothelial cells through inactivation of VEGF receptors . Therefore, adenosine can modulate multiple proangiogenic and antiangiogenic factors in a manner that promotes angiogenesis. The available data indicate that adenosine might be an essential mediator for up to 50% to 70% of the hypoxia-induced angiogenesis in some situations . This high estimate might be attributed to the fact that adenosine not only induces multiple proangiogenic growth factors (and inhibits release of antiangiogenic factors) but also incorporates mechanical hemodynamic factors through its vasodilatory actions that can promote development and remodeling of the vasculature. TLR stimulation initiates a CD39-based autoregulatory mechanism that limits macrophage inflammatory responses. Cohen HB, Briggs KT, Marino JP, Ravid K, Robson SC, Mosser DM. Dr Marshall mentioned on yesterdays conference that steroids can influence people mind to the point of homicidal behavior. Very interesting article discussing opioid actions of coffee. I tried to understand this paper, but couldn't. What does it mean in dumbed-down layman's terms, please? Page processed in 0.0644 seconds (75% database + 25% PHP). 17 queries executed.